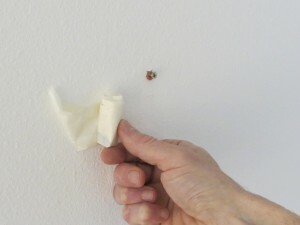 Drill dust can be a niggling DIY problem when making holes for wall fixings. It’s not a huge issue if the holes are made pre-decorating, but if you’re hanging pictures or curtain poles as finishing touches to your newly decorated room, then spouting a load of surface staining brick and mortar dust over the walls and skirting boards is not ideal. 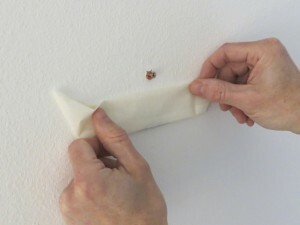 My simple masking tape technique below is one method I commonly use to catch drill dust and dispose of it, before it has a chance to sprinkle itself over surrounding surfaces. 1. As always when fixing into walls, make sure you find a safe drilling point. 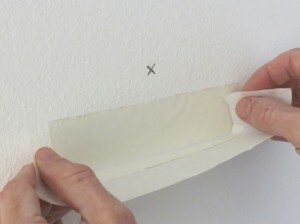 Make a mark and slightly below this, position a length of masking tape as shown, sticking only the top edge flat with the wall surface. 2. Add another slightly longer length to the bottom edge of the first, and stick each end to the wall so you end up with a masking tape platform below the hole. 3. 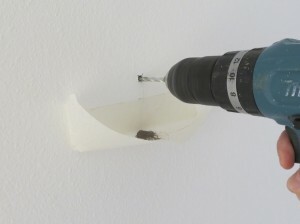 When you drill your hole the dust simply falls, and collects on the masking tape. 4. Once the hole is drilled, position your fixing, then carefully wrap the bottom edge of the tape up to stick along the top edge. 5. Carefully remove the masking tape ‘dust parcel’ from the wall and dispose of it. You will find that there are a few dust collecting gadgets designed for this type of job, on the market, but personally I just don’t think you need them. I’m sure they work, but when the above technique is so effective and costs the price of a few inches of masking tape, then why bother making the extra investment? I’ve also seen variations in my technique, such as using an envelope or Post-It note to do the same job, but I just find masking tape to be the most convenient for me. As a final thought, one further area where catching drill dust is a particularly good idea is when drilling holes in tiles. Drill dust has a nasty habit of staining grout, and sealant, which is incredibly annoying if you’ve just finished tiling your lovely new shiny bathroom. So try my dust catching technique and avoid those nasty stains. This entry was posted on Friday, April 5th, 2013 at 2:06 pm and is filed under 'How-to' Guides, Diy Basics. You can follow any responses to this entry through the RSS 2.0 feed. You can leave a response, or trackback from your own site.